Giveaway: Step 2 Clubhouse! Your kid will be the coolest on the block! Mom to Bed by 8 and Mom Does Reviews are happy to bring you this fun My Clubhouse giveaway! Do your children love to play make-believe? Do they need a fun, durable and safe toy for ages 2 and up? 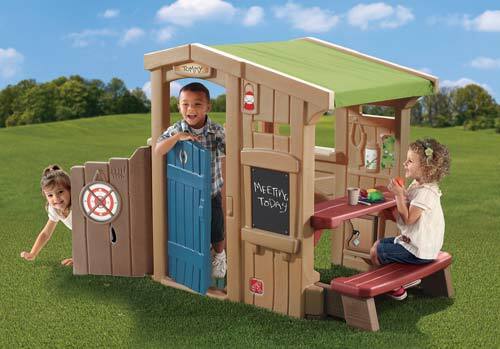 My Clubhouse is the cutest playhouse on the block! Clubhouse can be used all year long. Bring it inside in the winter so the fun can continue. Giveaway is open to US residents only ages 18 and over. Giveaway starts June 4th and ends June 25th. Enter on the easy rafflecopter below. Remember, you can’t win if you don’t enter. Disclosure: I received no compensation for this publication. My opinions are my own and may differ from those of your own. Sister’s Saving cents is not responsible for sponsor prize shipment.